Apple has received clearance from the Food and Drug Administration for its latest Apple Watch, which can now conduct electrocardiograms and deliver alerts if atrial fibrillation is detected. "This is the first ECG product offered over the counter, directly to consumers," said Apple chief operating officer Jeff Williams, announcing the Apple Watch Series 4 at an Apple event Sept. 12. "You can now take an ECG anytime, anywhere, right from your wrist." To measure the heart's rhythms, a user presses their finger against a button on the watch. After 30 seconds, the watch delivers a heart rhythm classification, telling the user whether their rhythm is normal or atrial fibrillation. The data are stored in the Health app on the iPhone. From there, users can share the data in PDFs with their physicians. The watch and heart rhythm alerts fall under the FDA's purview because they provide patients with ECG data. "This is de novo clearance, which means it's the first of its kind," Williams said. The data could ultimately be useful for Apple, said Chris Steel, global healthcare lead at PA Consulting. "The analytics potential of a fully medical-grade ECG on every Apple watch users' wrist is significant, and would provide Apple with yet another hugely valuable data source on which to build additional services," he said. Apple began making moves into heart rhythm detection in late 2017, when the company and Stanford Medicine launched a research study using the Apple Watch to identify irregular heart rhythms. That study relies on older models' heart-rate sensors, which send heart rhythm data to the Apple Heart Study app. If any of the data look like atrial fibrillation, the app notifies the wearer, who also gets a free consultation with a doctor via the American Well telehealth platform. Stanford is using the data collected in the study to look into using heart rate sensors and similar tools for precision health. "Capturing meaningful data about a person's heart in real time is changing the way we practice medicine," said American Heart Association president Dr. Ivor Benjamin at the event. Apple assured the audience at Wednesday's event that the data captured by the watch are encrypted, both on the device itself and in the cloud. But the ECG capability nevertheless brings up new questions about privacy, said Angela Radcliffe, general manager of clinical trial solutions for PulsePoint. For instance, consumers may one day be able to monetize their health data, she said. "Healthcare consumer data might be the next part of the gig economy." 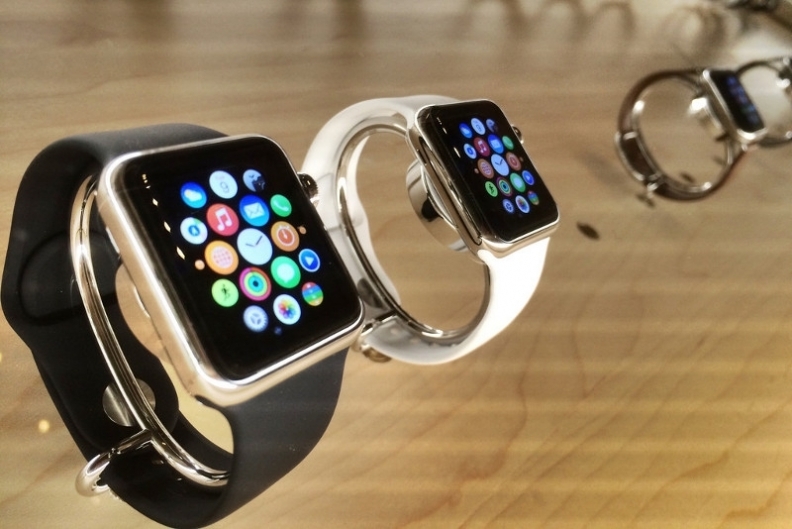 The ECG is not the only new health feature Apple is adding to the watch. The new model can also detect falls. If it senses a fall has occurred, it sends an alert to the wearer with the option to place an emergency call. And if the wearer is immobile for a full minute, the watch will start the call automatically. These new capabilities come during a busy year for Apple in healthcare. In iOS 12, Apple's latest iPhone operating system, the company will facilitate data transfer between its Health app and third-party apps. The Health app data comes from more than 500 hospitals and clinics' electronic health records, from which patients can pull their health information thanks to the FHIR data standard. Patients of select health systems have been able to do that since early 2018. That capability aligns with federal agencies' work in the space. The CMS is pushing MyHealthEData, an initiative to give patients control of their health data, and the ONC and others are pushing work through the 21st Century Cures Act, which tasks vendors with using open application programming interfaces for data exchange. Industry insiders expect Apple's foray into EHRs to force traditional EHR vendors to open up access to data through open application programming interfaces.